Lens Description: The Sigma 8-16mm f/4.5-5.6 DC HSM is the only one of its kind. This is the first ultra wide zoom lens with a minimum focal length of 8mm, designed specifically for APS-C size image sensors. It has an equivalent angle of view of a 12-24mm lens when used on digital camera with an APS-C size image sensor. Sigma’s new FLD glass elements, which have the performance equal to fluorite glass, compensate for color aberration. One hybrid aspherical lens and two glass mold elements give excellent correction for distortion and astigmatism. An inner focusing system produces high definition images throughout the entire zoom range and the Super Multi-Layer Coating reduces flare and ghosting while superior peripheral brightness ensures high contrast images throughout the entire zoom range. HSM ensures quiet and high speed AF as well as full-time manual focus capability. It has a minimum focusing distance of 9.4 inches throughout the entire zoom range which allows photographers to emphasize the subject by creating exaggerated perspectives. 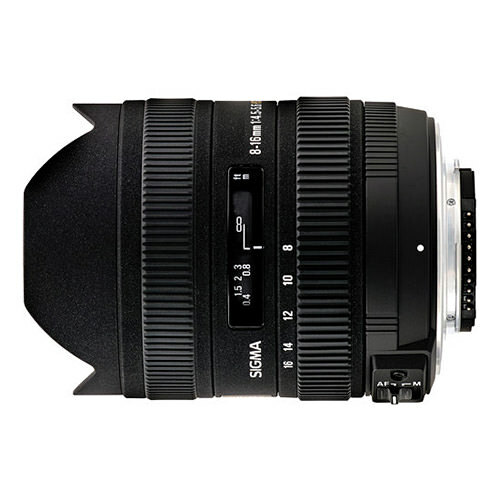 This lens has a compact construction with an overall length of 4.2 inches and a maximum diameter of 2.9 inches and is perfect for shooting landscape photography, architecture, building interiors, photojournalism, wedding photography, group pictures and more. I shoot this lens on a Nikon D90. My copy is wonderful at f/8 to f/11 and perfectly acceptable for most applications “wide open” (f/4.5-5.6, oh well…). Simply will not perform AF in low light. That said, I appear to have a very good copy and there are enough QC complaints about this “old school” Sigma lens to raise the buyer-beware issue. I rate this lens very highly but either try the copy before you buy it, or be prepared to put your lens through some testing if it arrives by mail. Distortion? Sure, but Lightroom 4 has a profile for this lens which takes most of that away. Bonus baseball: at 15-16mm it covers FX. So if you didn’t need to pack your 14-24 because you were taking a prime to cover the tele-end of that, this could do in a pinch. Is the IQ as good on this lens? Absolutely not. But it’s always nice to know one’s emergency options. Value for money: 4/5, but see below. Compare to: Tokina 11-16mm f/2.8. I really like the Tokina, and most people will probably choose the Tokina for the bigger aperture–not so much for the bokeh, because wide-andles are really about bokeh, but for the improved ability to shoot in less than ideal light. To my knowledge, the QC issues on the Tokina are rather less frequent. I chose the Sigma because I really wanted those extra mm. Compare also to: Nikon 10-24mm, a variable aperture offering with wider maxima (f/3.5-4.5). Again, the wider end was more important to me. I already have a twenty-something-mm prime, so had the Sigma not existed it would have been the Tokina for me. Compare also, perhaps, to Nikon’s higher quality 12-24mm f/4, but at this point the focal lengths are starting to be quite dissimilar. In short, if you want the extra mm, it’s the Sigma, and don’t settle for less than a great copy. If you don’t need the extra mm, then it’s the Tokina for speed or one of the Nikons for range.